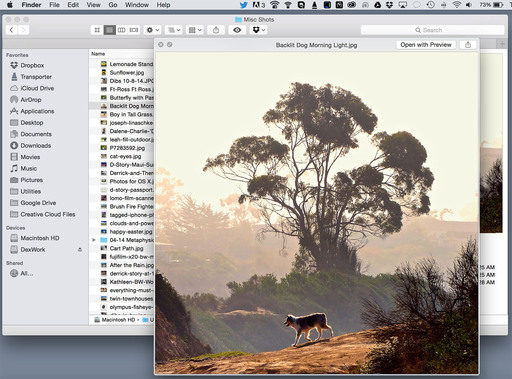 Mac OS X Yosemite builds upon photo browsing improvements we saw in earlier versions, creating a terrific working environment for photographers. And the best part is, you never have to leave the Finder. Here are a few basic buttons to click to supercharge your photo browsing experience in Yosemite. 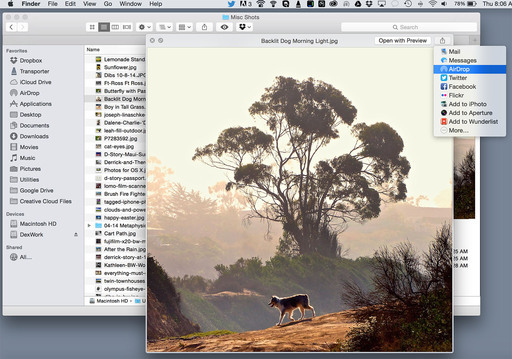 With Finder Preview turned on, you can work in List View and still get a good look at your images. It's easy to activate. In the Finder, go to View > Show Preview. 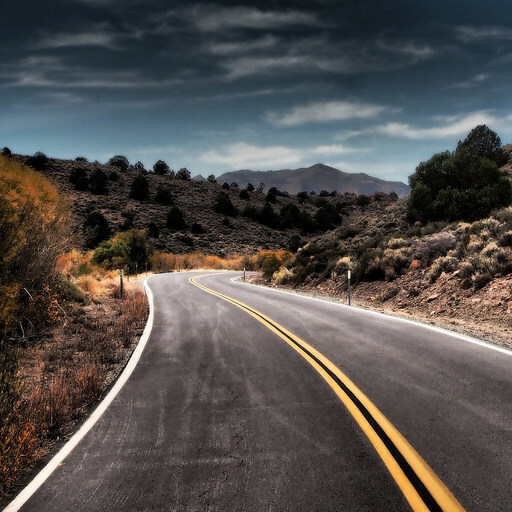 Most photographers will want to use the shortcut: Shift-Command-P. Bonus Tip: You can add Tags directly from the Finder Preview window by clicking on the blue "Add Tags" link. Quick Look for even a better view. We had Quick Look in Mac OS X Mavericks, but it seems more useable now in concert with Finder Preview. With a file highlighted, click on the "eye" icon in the Finder Toolbar to open a larger version of the photo. If you like keyboard shortcuts, Command-Y will enable Quick Look, or even faster, just tap the spacebar (thanks Scott Stuart). Bonus Tip: You can "pinch to zoom" on a trackpad for a more detailed look at your photo. It's easy to share the image directly from Quick Look. Once you're in Quick Look, you have a variety of sharing options. We had a more basic version of this in Mavericks, but Yosemite adds "Share Extensions," which enable you to customize this menu. You can build a sweet workflow, starting with the Finder. I have more Yosemite gems for photographers coming in future posts. Try these out, and see what you think. 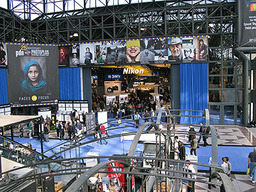 PhotoPlus is right around the corner with the Expo opening on Oct. 30 at the Javits Convention Center in New York. If you're attending, I'd like to meet you. Here's my schedule. I'm in the c't Digital Photography/Rocky Nook booth every day for 2 hours. Visit me there, then, and mention "The Nimble Photographer" or "The Digital Story Podcast," and I'll have a gift for you from The Nimble Photographer Store. 1:00 to 3:00 PM - "Mirrorless Cameras" - c't Digital Photography Magazine Booth 6. 12:00 to 12:20 PM - "The Nimble Photographer" - lynda.com Booth 267. 12:30 to 12:50 PM - "Portrait Tips" - lynda.com Booth 267. 1:00 to 3:00 PM - "What's in My Bag" - c't Digital Photography Magazine Booth 6. 11:30 to 11:50 AM - "Social Media for Photographers" - lynda.com Booth 267. 2:00 to 2:30 PM - "The Nimble Photographer" - Panasonic Booth 837. 3:00 to 3:20 PM - "Lightweight Backup and Storage for Traveling Photographers" - lynda.com Booth 267. I hope you have a chance to stop by and say hello. I don't photograph much wildlife, but I always pack a long zoom lens for my outdoor work. Why? Because it affords me higher angles on subjects that often require my positioning a bit farther from them. Mono Lake, North Shore - photo by Derrick Story. I photographed this image on the North Shore of Mono Lake with an Olympus ED-M 75 to 300mm II f4.8-6.7 zoom lens at an distance up the hill. I didn't like the angle from the water's edge, so I went back up the road for a higher perspective. The other advantage of a telephoto for landscape work is that it compresses the scene. This is often flattering to the subject. Plus, it allows me to group together the elements that I think are important in the composition. Image captured with an Olympus 75-300mm zoom lens mounted on an Olympus OM-D E-M10. ISO 250, f/8, -1/3 EV, hand held. This week on The Digital Story Photography Podcast: Mac OS X Yosemite for Photographers, Shooting Fall Color in the Eastern Sierra, iPhone Digital Back for Older Hasselblads - All of this and more on today's show with Derrick Story. Story #1 - Adobe Provides Detailed Instructions for Migrating from Aperture to Lightroom. Yes, your get star ratings and most metadata. No, you don't get image adjustments. (Source: F-Stoppers). In other news, iMac with Retina 5K display. Here's how I would configure it: 3.5GHz Quad-core Intel Core i5, 8GBs RAM, 3TB Fusion Drive (Upgrade), AMD Radeon R9 M295X 4GB GDDR5 (Upgrade) Price: $2,899 (Source: Apple.com). And finally, Flickr version 3.2 with upgrade for iPad viewing is terrific. (Source: TheDigitalStory.com). AirDrop between iOS device and your Mac - Make sure you're both on the same network, enable AirDrop on both devices, and files can be shared between them. Drag and drop to iCloud Drive - I created a My Photos folder on iCloud Drive where I can backup photos by dragging and dropping in the Finder. Aperture and iPhoto Updates - After updating both applications, they run wonderfully in Yosemite. Photos.app - Coming in early 2015, we'll see the next generation photo management software from Apple for the Mac. Story #3 - Fall Color in the Eastern Sierra - Spent a few glorious days in Mono Lake County last week. The color around Bridgeport, Lee Vining, and June Lake was impressive. Here's a report with a few Fall color photography tips. Plus, I include a field report on the Western Digital My Passport Wireless hard drive. 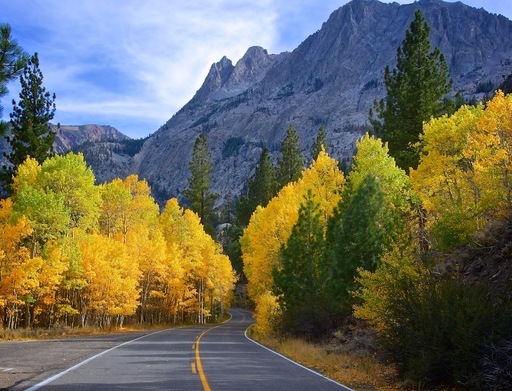 To see some of the pictures, take a look at my article, A Drive Through Eastern Sierra Fall Color. Story #4 - Hasselnuts iPhone Adapter for Older Hasselblads - This is a crazy device that I tested on my last road trip. Essentially, I can attach a handsome adapter that looks just like a film magazine for my Hasselblad 500C, but it allows me to use an iPhone as a digitizer. In my opinion, the resulting images are half Holga, half Polaroid transfer. I talk more about it in the fourth segment of today's show. Photo Assignment for October 2014 is "Water". This new stock looks great: 66lb. Palo Duro Satin features a subtle surface texture and elegant warm tone, because it contains minimal optical brighteners in the base stock and none in the coating. The warmth of this product is great for portraits, naturescapes, and black & white prints with just a hint of sepia. If you want that fine art pro lab photo finisher look, check out this new stock. They've ramped up their capacity, so we can go for volume for the holidays. Special for TDS listeners, a 20% discount on all SizzlPixÂ ordered, now through end of November! For orders placed by October 31, there should still be time for free mini-samples prior to production. Using the comment space on the newly streamlined SizzlPix order page, write "TDS 20 percent discount," and if a free mini-proof is wanted prior to production, "free proof first," and your mailing address. SizzlPix! 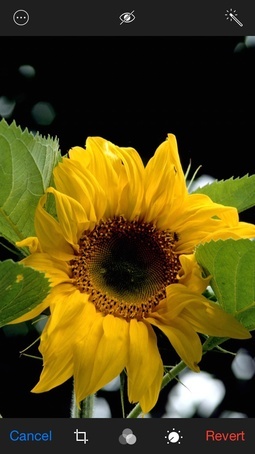 - High resolution output for your photography. You've never seen your imagery look so good. SizzlPix.com. SizzlPix! now is qualified for PayPal "Bill Me Later," No payments, No interest for up to 6 months, which means, have your SizzlPix! now, and pay nothing until April! The updated Flickr iOS app for the iPad looks so nice that you could almost say it was worth the wait. But what a wait it's been. Like many other users of the online photo sharing service, I wasn't enjoying the beautiful work by those I followed often enough. In large part, it was because Flickr for iOS just wasn't compelling on my iPad mini. Flickr 3.2 on an iPad mini. That's changed now. Both the presentation of my photos, and browsing those of others, is greatly improved. In short, Flickr on an iPad now looks like an iPad app, not an iPhone program stretched 2X for a tablet. Other goodies include improved organization tools, integration with iOS 8 Share Extension capability, and a bump in performance. If you already have Flickr on your iPad, the app will automatically update. If you've held off on using Flickr on your tablet, you should give this a look. 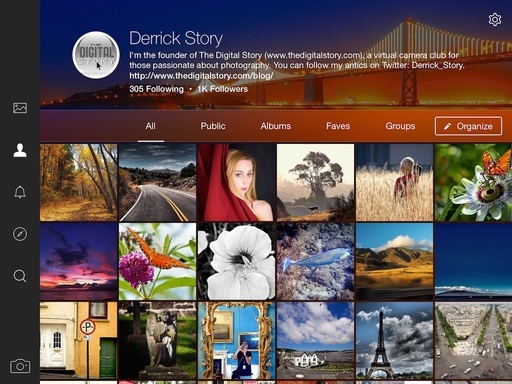 Flickr 3.2 requires iOS8 and is available for free in the iTunes App Store. Compatible with iPhone, iPad, and iPod touch. This app is optimized for iPhone 5, iPhone 6, and iPhone 6 Plus. Flickr Essential Training 2013 - I explore the entire Flickr universe, mobile and computer, in my lynda.com title, Flickr Essential Training. Stop by and take a look. 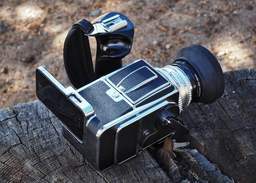 My 30-year-old Hasselblad hasn't seen much action over the last decade. That's changing now thanks to the Hasselnuts iPhone Digital Back that I received recently as part of my support for their Kickstarter project. With the adapter, I can attach an iPhone 4S, 5, or 5S to the handsome "film back" (that's really the adapter) and capture images that I call, "half Holga/half Polaroid transfer." I talk about the setup process in my latest article for c't Digital Photography Magazine, Hasselnuts iPhone Digital Back for Older Hasselblads. I've also included a gallery of images captured with my 500C, Zeiss 80mm lens, and an iPhone 4S. I took the Hasselblad out for a late afternoon walk around Bridgeport, CA. I noticed that I was working at a more relaxed pace than normally. These types of images are not for everyone, for sure. But I'm going to make some prints on Red River Polar Matte paper. I think they'll have that Polaroid transfer feel that I enjoy. If you want to learn more about the Hasselnuts adapter, take a look at my article. In the meantime, I'm going to keep experimenting with it. After spending time here in the Eastern Sierra, I'm more excited than ever about our upcoming 2015 workshop, featuring the abandoned silver mining town of Bodie. 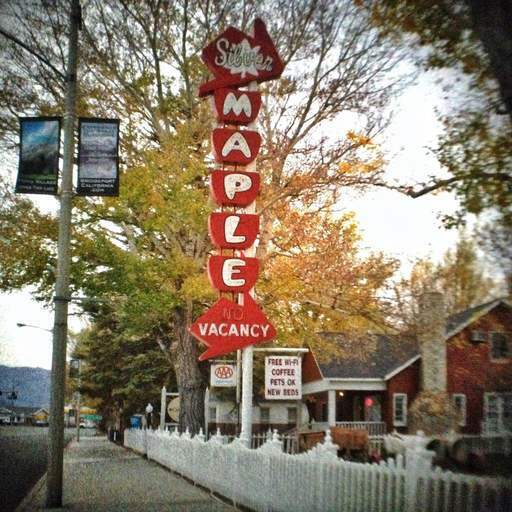 I've found a wonderful place for our accommodations and workroom, the Silver Maple Inn, in Bridgeport. From that location wer'e only 20 miles from Bodie itself. 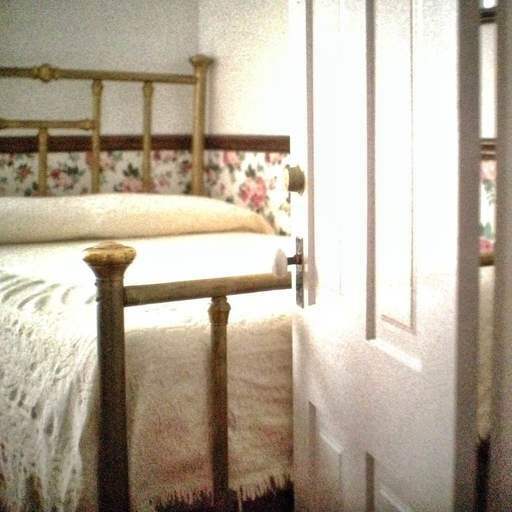 Our workroom will be in an 1800s house that has been converted into a B&B. It will be very comfortable and accommodating while we process our images and share them with each other. Today, I'm heading down to Lee Vining and onto Mono Lake. I'm thinking that we will do this trip on the second day of the workshop. Stay tuned for more updates from the road. Most photographers think a lot about their camera gear. But once the bodies and lenses are packed, there are a few additional items that should be included. 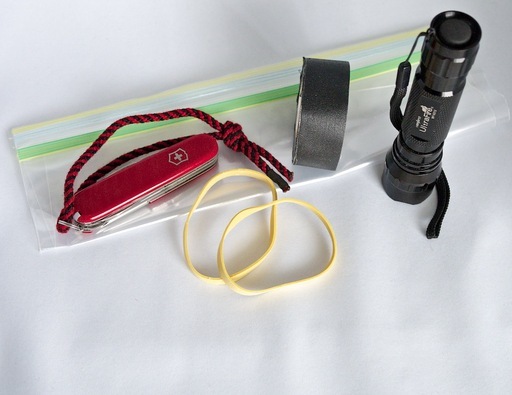 Here are five non-photo accessories that I carry for every trip. Flashlight - Yes, my iPhone has a handy light for digging around in the bag, but I don't want to use that for working my way down a trail after sunset. And it's not very good for light painting. So I bring an additional light, such as the Ultrafire LED flashlight torch ($15). Swiss Army Knife - I've lost count of the number of times my Victorinox has saved the day. I like the lighter models, such as the Climber II Pocket Knife ($20). Ziploc Bag - Everyone knows to bring one, but they are often forgotten. In addition to everything else they do, put your camera in the Ziploc before you come indoors after a cold weather shoot. The condensation will accumulate on the bag and not your camera. Rubber Bands - They can hold DIY bounce cards to flash heads, stabilize daring camera set-ups, serve as hanging loops, and a host of other MacGyver solutions. Gaffer's Tape - If a rubber band doesn't work, gaffer's tape probably will. You don't need an entire roll, a few strips on the inside of your camera bag should work just fine. One final thought, if you're flying to your destination, remember to move your Swiss Army Knife from your camera bag to your checked suitcase. I hate having mine confiscated by the TSA. These items have a high Nimbleosity Rating. What does that mean? You can learn about Nimbleosity and more by visiting TheNimblePhotographer.com. This week on The Digital Story Photography Podcast: Apple's iPhoto Switcheroo in iOS 8, Ten Quiet Cameras, Lithium-ion Batteries of the Future - All of this and more on today's show with Derrick Story. Story #1 - Drobo has announced a new configuration for its Mini robotic storage, leveraging four 2-TB HDDs and selling the complete package for $999. The Mini features 2x Thunderbolt & 1x USB 3.0 ports, power fail protection with battery backup, and Drobo BeyondRaid for advanced data protection. (Source: Drobo). In other news, New lithium-ion battery tech could charge in minutes, keep working for decades - A research team at Singapore's Nanyang Technological University is proposing a replacement for the anode of a typical lithium-ion battery that they say could be cheaply and easily manufactured, and yet provide significant benefits such as 20 year life and super fast recharging. (Source: Imaging-Resource.com). And finally, Canon's Upcoming 11-24mm f/4L Will Reportedly Cost a Hefty $3,000. 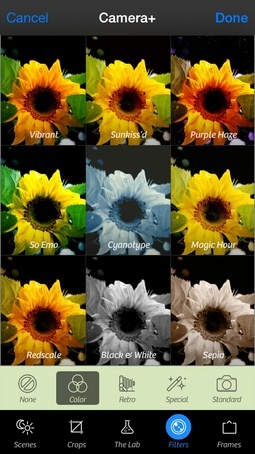 (Source: PetaPixel.com). Story #2 - 10 Quiet Cameras (and 5 Very Noisy Ones) - Sascha Steinhoff published Keeping it Quiet in the latest issue (#17) of c't Digital Photography Magazine (page 90). She shares a through examination of what causes camera noise, then tests 30 popular models for their sound levels. Here are the 10 quietest cameras in normal shooting mode. 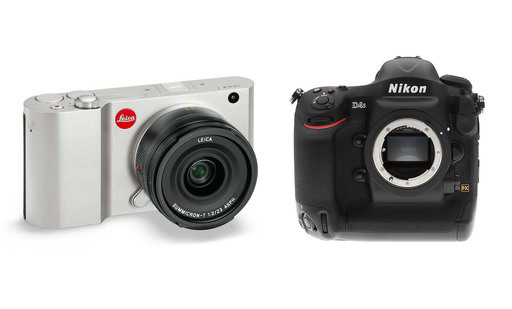 Mirrorless cameras dominated the Top 10. Plus, seven of these models have a "Quiet Mode" that emits virtually no sound during capture. The three models that still produced noise in Quiet Mode (Pentax Q7, Pentax Q, and Nikon 1 V3), were able to substantially reduce sound, up to 40 percent quieter. The bottom of the list was dominated by professional grade DSLRs. Here are the five noisiest models. Even in Quiet Mode or Live View, theses cameras created more sound than any of the Top 10 models in normal mode. Story #3 - Workshop Dates for 2015 Season - On the TDS Workshops page, I've added the dates for next year's events. Here's how they shake out: Moving from Aperture to Photos or Lightroom - Feb. 6-7, 2015, San Francisco Street Photography - April 24-26, Bodie and the Eastern Sierra - June 11-13, and Fall Color with Safari West: October 23-25. Plus I talk about this week's scouting trip to the Eastern Sierra. Story #4 - Did Apple Short Change Us with Photos.app in iOS 8? I've been getting lots of comments about the discontinuation of iPhoto for iOS and the shortcomings of the new Photos app that replaced it. I discuss in the fourth segment of today's show. Order your SizzlPix early to get holiday shopping out of the way. You'll give the double whammy of your own great image that has special meaning to your recipient, combined with the delightful surprise they'll have, seeing the back of the SizzlPix, wondering, "what the heck is this? ", then lifting it out of the box, flipping it over, and there it is, a spectacular SizzlPix -- like Retina Display for the wall -- all ready with hanger attached! In addition to subscribing in iTunes, you can also download the podcast file here (30 minutes). You can support this podcast by purchasing the TDS iPhone App for only $2.99 from the Apple App Store. One of the exciting enhancements in iOS 8 for photographers is "Photo Extensions." What that means is that 3rd party developers, such as the creators of Camera+, can enable their editing tools to be accessed within Apple's Photos App. Photo Extentions opens up a whole new experience for photographers. Here's how to use them. Open an image in Photos App, then tap Edit in the upper right corner. Tap on the "more" icon in the upper left corner of the app. It's a circle around 3 dots (as shown in the top illustration). In the screen that appears at the bottom of the screen, tap on More, then enable the app that includes the Photo Extensions that you want to use. In my case, it was Camera+. Camera+ will now reside in the bottom popup screen. Tap on its icon to access its editing tools. Edit your photo using the tools in the set of extensions you've selected (as shown in the bottom photo). The changes you make to the image will be saved automatically to the camera roll. Your edits are non-destructive. So regardless what you do with these new tools, you can always revert to original if needed. 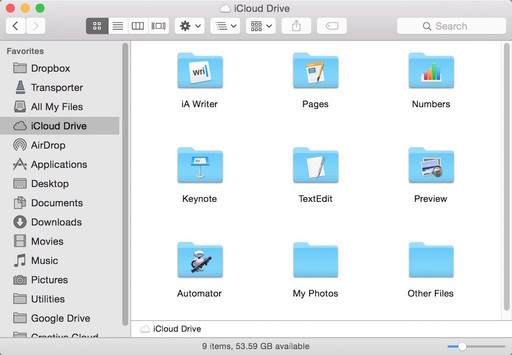 This functionality is a preview of things to come on the Mac with the release of Yosemite. The new desktop Photos App will also have extensibility. It will be interesting to see how this changes desktop editing for Mac users.